Monday October 13th was Thanksgiving Day in Canada, but we find most people have their celebration on the Sunday before...and so we were with friends on the 12th. More friends invited us to their "Alternative Thanksgiving" on the 18th! 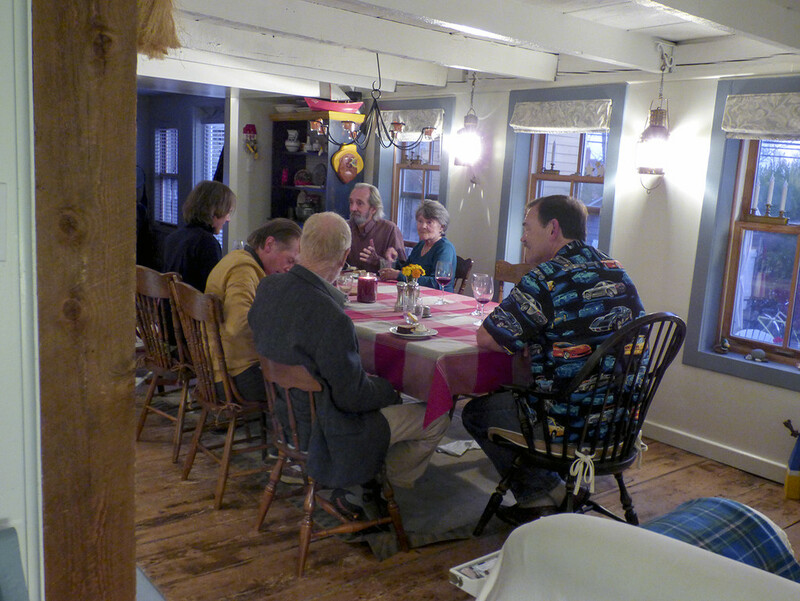 I have lots of "pretty pictures" of food and table settings, but this shows the interior of one of Lunenburg's older homes. It sits on property that was a land grant in 1753 and the house was built in the very early 1800s. (OK, you folks in England, for us, this IS old!) They've restored it to a lovely, comfortable living space, and filled it with bright and colourful pieces of folk art. The gathering was "quite eclectic", and we were meeting half the group for the first time. Just for fun, I don't think I'd be remiss in saying that the makeup was of: "a former hippie-still- who recently ran for Mayor", a renowned artist, two psychologists, a shop owner for the past 15 years, a thespian,a musician, three active town volunteers, two lawyers, a woodworker/furniture builder/also a landscape photographer, a man, new to the neighbourhood, whose MIL passed away recently (he's refurbishing her home while his wife remains at her job on a major magazine in Toronto. )...and then there was Ken and me. Oh, there were only 10 of us at the table, but people here wear multiple hats! The wheels are turning in our minds as to what sort of American Thanksgiving to offer our friends next month... *Love* those turkey dinners! Aren't you the lucky ones with 2 Thanksgiving feasts "under your belt" and at least one more to come in the US! Although knowing your sociability, I wouldn't be surprised if you don't have a few extra on your way back to California! BTW, love Ken's "classic" shirt. @allie912 LOL...had to convince Ken that he "needed" that shirt, and he gets comments and compliments every time he wears it! We both laugh! We aren't heading to the states until Dec 10, so my hope is to have an open house on Am Thanksgiving and treat our friends before we head back...sound like a plan? @Weezilou Definitely! Although how can you top the menu of your Canadian hosts?? Oh you guys. Love your descriptions that go with your photos, Louise. It definitely sounds like small town Lunenburg agrees with you..... No wonder you can't wait to get there each year. I just love the warmth of this photo. Thanksgiving is such a great holiday. It's cool that you chose to celebrate on an alternate day because of conflicts. I like how this is so different from our homes and Thanksgivings in S. Florida! I was invited to a Thanksgiving at the home of a chef one year. She prepared 3 different turkeys, 3 different types of potatoes, 3 different cranberry sauces, etc. She asked guests to bring wine and desserts. Guests also did dishes bc - holy hell - all that cooking created a mountain of chaos in the kitchen/pantry area. It was AMAZING!!! Just fabulous!! Dishes were a small price to pay for the delectable food I enjoyed. Oh wow!!! We don't do Thanksgiving. Thank goodness. I hate cleaning up!! @voiceprintz Everyone should have some ultra-memorable holidays like that one! The meal sounds sensational, and the camaraderie, just as good, I would imagine! When we first moved to Lunenburg, being the social town that it is, I'd be invited to many dinners, so I had to learn to throw dinner parties and reciprocate... My hesitation was that I had no dishwasher here for a number of years! Many nights, after midnight, my guests wouldn't leave until we'd (altogether)l washed the dishes! See how it is I have so many good friends here?! "All for one and one for all"! @golftragic See my note above! I'm like you, hate the clean-up part, but it's more fun when everyone pitches in to help! Wow! Sounds like a wonderful get-together! It looks and sounds exceedingly convivial - good company and good fare! Thanks for sharing you wonderful moments of life. Sounds great! Luckily I have an American friend living in Finland, so I have eaten turkey with dressing and gravy and pumpkin pie with whipped cream. Yummy!